Congratulations to "Bn100", the winner in Jennifer's giveaway. Thank you to all who participated! When I first started writing contemporary romance, I took a lot of classes that taught writers the way to make your characters interesting and real was by giving them flaws. Unfortunately, I kind of took that information and ran with it. Way. Too. Far. In fact, it got my book rejected by many editors and publishers. This was disappointing because I really loved my characters and the story. It was a hard thing to do, but I had to take a good long look at my manuscript and see what needed to be changed. So I reworked the story and managed to change a few things. 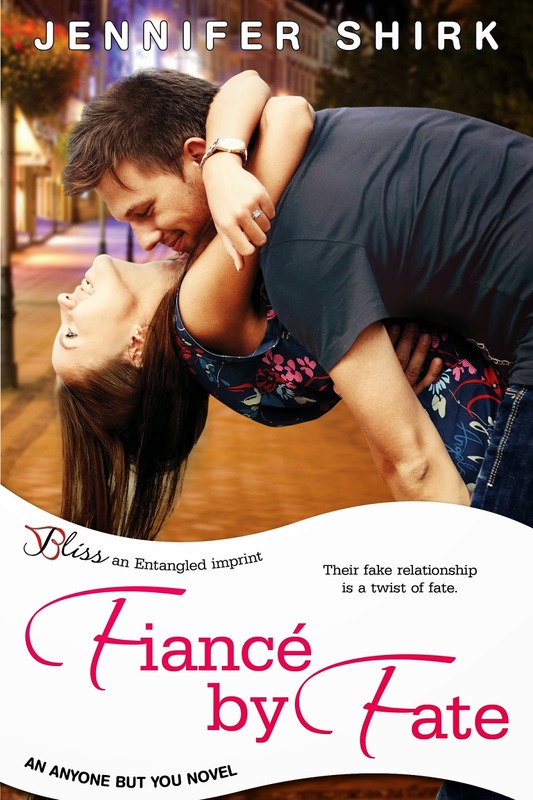 Entangled Publishing loved the story and now here I am on Blog Tour promoting my book Fiancé by Fate! Hope you all get to check it out! Question: I am not a smoker and never have been, but do you consider a hero who is a smoker taboo or not heroic? Or would it not matter? **Comment for a chance to win an ebook copy of Jennifer's new romance Fiancé by Fate! Giveaway ends 11:59pm EST April 14th. Please supply your email in the post. You may use spaces or full text for security. (ex. jsmith at gmail dot com) If you do not wish to supply your email, or have trouble posting, please email maureen@JustContemporaryRomance.com with a subject title of JCR GIVEAWAY to be entered in the current giveaway. It doesn't matter whether the hero smoke or not. I just need the hero to be who he is and to have the story make sense with him and the heroine in it. I'm not a big fan of smokers, maybe it's because my mom smoked until I was 12. I think I'd be more sympathetic to a guy who was trying to quit. Its a fine line between making a character true to your vision and making them sympathetic. Too perfect, and readers don't believe in them. Too flawed and they can't quite identify with them. I don't care if the hero is a smoker as long as he isn't a heavy smoker. If he always has a cigarette in his hand, it's a turn off. I don't really care for a hero that smokes. I recently read an older book now out in ebook format and the hero smoked. It did bother me.